Profiling your C++, C, Fortran or F90 code on Linux is as simple as running "map -profile my_program.exe". There are no extra steps and no complicated instrumentation. MPI, OpenMP, pthreads or unthreaded codes can all be profiled with Arm MAP. The graphical results are precise, straightforward to interpret and bottlenecks are shown directly in the source code. Integration and a common interface with the debugger Arm DDT in the Arm Forge tool suite makes moving between tools a breeze, saving you time and energy throughout each stage of the development cycle. Existing performance tools can give a powerful view, when you run them and spend the time analyzing their output, but when was the last time you ran a profiler on your production code? We built Arm MAP with less than 5% runtime overhead - and the data files created by MAP remain small, for any size and duration of run - so you can run it every day, on every change, giving you fascinating and powerful insights into the performance of real codes under real conditions. Fundamental to MAP is that it shows time alongside your source code - so that bottlenecks are clearer to see, and the top-down stack view of time across all processes means its easy to navigate through the code to the parts that matter. As systems get larger, more and more codes are being affected by poor I/O performance. Often, this goes unnoticed or mislabelled as poor application scaling. Arm MAP shows you exactly where your file I/O bandwidth is being used, helping to diagnose overloaded shared filesystems, poor read/write patterns and even system misconfiguration issues. Getting performance from multithreaded code can be a challenge - but Arm MAP makes it easy to see where thread synchronization is costing cycles and where threads are spending their time. With views of CPU core activity, and code profiling by actual per-core walltime, Arm MAP is the thread profiler that threaded code has been waiting for - it's unique in profiling threads accurately and quickly on real workloads. Read our OpenMP profiling blog explores how MAP profiles threads. Watch a video on profiling an OpenMP genomics code with MAP. As your application progresses, Arm MAP can show you the real memory usage across all processes in the application and all compute nodes/servers. The memory usage helps you identify imbalance, or changes caused by phases in your application - and MAP shows this alongside your source code. The visible high-water mark of usage helps to track down applications that rely on 3rd party libraries which temporarily consume memory and push memory usage over the edge. For applications that use increasing memory over time, potential memory leaks can then be addressed with Arm DDT's in-built memory debugging. Additionally, the time spent in memory accesses is one of the key metrics profiled so that poor memory access patterns and cache use are found easily. Arm MAP supports the latest NVIDIA CUDA GPUs and helps you to profile CUDA GPUs and the CPUs together. Profiling enables you to see how your CPU waits for GPU completion - and view CUDA GPU time in global memory access, GPU utilization and even GPU temperature. 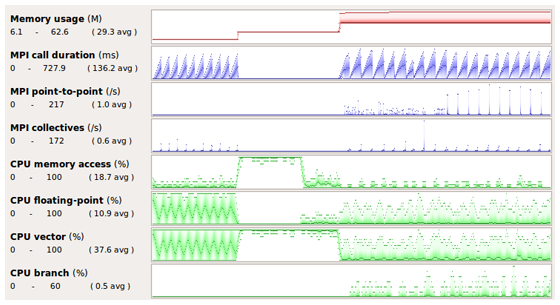 Read more about MAP's features for profiling codes that use CUDA. Watch a video on Arm Forge helping developers to use CUDA and OpenACC effectively at NVIDIA's GTC conference. Energy consumption and peak power usage is increasingly important for high-performance applications and their users. With Arm MAP's Energy Pack,developers can optimize for time and energy. The latest Sandy Bridge and above Intel processors are supported (including Haswell and Broadwell chips) - via their in-built Intel RAPL power measurement capability - for CPU power measurement. GPU power measurement is available on any NVIDIA GPU with power monitoring support. Node-level measurement is also available for systems supporting the Intel Energy Checker API or the Cray HSS energy counters (XK6 and XC30 and above). Arm MAP is cross-platform profiler supporting the major Linux platforms. It provides its data in an open XML format, making it ideal for post-processing to characterize and compare the performance of key codes on different hardware platforms. Even without access to the original source code, Arm MAP tracks and reports on CPU, memory and MPI performance metrics over time, giving you everything you need to evaluate and compare potential new platforms. Arm MAP supports all of today's leading technical-computing platforms - which means you can be productive on any system. It's an MPI profiler, a multi-threaded profiler and an OpenMP profiler - and supports mixed hybrid programming models. HPC consultants and support staff have a deep understanding of performance and optimization tools. Yet again and again they tell us much of their time is spent diagnosing the same basic mistakes new programmers make over and over. We designed Arm MAP so that new developers of MPI, OpenMP and regular code can see the cause of common performance problems at once, freeing up experts to dive deeper into complex and leadership-class optimization problems.